How Blue Cross became part of a dysfunctional health care system. When Alma Dickson slipped on an icy sidewalk in Dallas, Texas, she knew she was hurt. But she wasn’t sure that she could pay for the medical care she needed. The year was 1929 and Dickson, a schoolteacher, didn’t make enough money to pay for x-rays and treatment on her own. But Dickson had recently signed up for something new: A plan under which she paid a monthly premium in exchange for a promise of care at a local Dallas hospital. Dickson went, had her broken ankle set, and left without paying a penny. The Dallas plan eventually evolved into a network of similar plans around the country, bringing affordable medical care to millions who, like Dickson, would not have had it otherwise. At one point, the director of the Minneapolis plan commissioned a series of advertising posters. The posters featured a nurse, whose image would quickly fade from memory. But they also featured a symbol that would become the most recognizable and, for a while, most trusted icon in American health care. That symbol was a blue cross. Today, of course, the blue cross has come to symbolize something else: A deeply dysfunctional health care system. Last month, Anthem Blue Cross of California, a descendant of that original Dallas plan, announced that it was raising premiums for some of its customers by 39 percent. A report from the Center for American Progress Action Fund, a liberal advocacy organization,* showed that Blue Cross plans from other parts of the country had similar ideas in mind. The high prices mean that beneficiaries will struggle to pay premiums--and, in some cases, be forced to give up coverage altogether. What enabled the Blue Cross plans to succeed was their effective monopoly on the health insurance business. They had a huge, diverse base of customers--one based heavily on large groups of employees, like the Dallas schoolteachers--which meant they had sound finances. The majority of people were relatively healthy, with few medical bills. Their accumulated premiums were sufficient to cover the bills for that small group of people who, because of accident or disease, had much higher bills. But as enrollment in the Blue Cross plans swelled, the commercial insurance industry took notice--and saw an opportunity. If Blue Cross was selling to everybody and charging everybody the same rate, that meant some people--healthy people--were effectively paying a bit extra in order to subsidize the sick. The commercial insurers figured that if they could target just the healthier customers, by charging higher premiums or refusing coverage to people with medical problems, they could offer lower premiums to these people and still make a profit. They were correct. And the effect on Blue Cross was devastating. Over time, Blue Cross plans lost more and more healthy customers, leaving a pool of beneficiaries in relatively worse health. 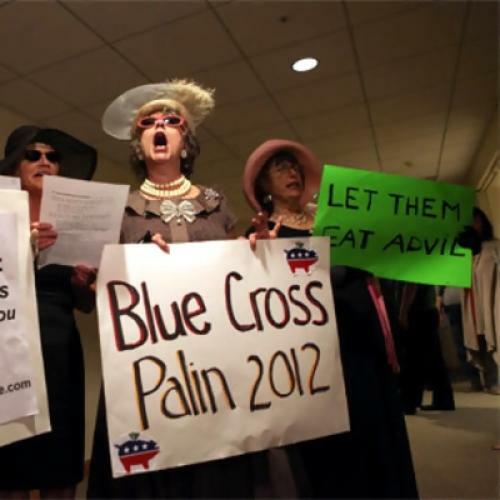 In order to finance their medical bills, Blue Cross had to raise everybody’s premiums. With each increase, more and more healthy people fled for cheaper plans, creating a vicious cycle. Eventually, the Blues faced a choice: Start acting like the commercial insurers, in order to compete, or go out of business. They chose the former. Soon Blue Cross plans were screening potential customers, charging them higher premiums or no coverage if they came with pre-existing conditions. Eventually, some of the plans converted outright to for-profit entities. Anthem Blue Cross of California is the product of such a conversion. It is among the insurers that have drawn media scrutiny, and government investigations, for its practice of canceling the coverage of people who file large medical claims. Last year Anthem Blue Cross paid a $10 million fine to the state of California for this practice and agreed to restore more than 2,000 canceled policies, although it denied any wrongdoing. Meanwhile, its parent company, Wellpoint, posted profits of nearly $3 billion in 2009, despite the economic downturn. Wellpoint executives have defended its approach to the insurance business, arguing--among other things--that it is necessary to compete in the marketplace. That is true. If some insurance companies are allowed to do whatever they can to maximize profits, whether it’s keeping out people with pre-existing conditions or charging higher premiums to people with high medical expenses, then companies who don’t keep up will not be able to survive, any more than the old Blue Cross plans could. The only solution is to prohibit all insurers from discriminating against the sick and to make sure that everybody is part of large, financially sound insurance groups in which there are enough healthy people to subsidize the cost of the sick. This is precisely what the Democratic health care reform plans would do. Executives at Wellpoint and its affiliates have frequently said they agree with the argument. Publicly, they have pledged their support for health care reform as long as it includes an individual mandate, requiring that everybody carry coverage. (Otherwise, they argue reasonably, people won’t take coverage until they get sick, which would cause the same kind of financial death spiral that the Blues experienced decades ago.) But they’ve carried a different message in private, lobbying against tight restrictions on pricing policies and other regulation on insurance company behavior. It’s not surprising. The new Blue Cross plans have not only adapted to the realties of modern insurance marketplace. They've learned to thrive in it. If the Democrats get their way, the plans will have to change their business model again, so that they act a bit more like the Blue Cross plans of old--the ones that helped schoolteachers, not stockholders. *Correction: I originally attributed the report on rate increases to the Center for American Progress, a think-tank. It came from the Center for American Progress Action Fund, which is an affiliated advocacy organization.